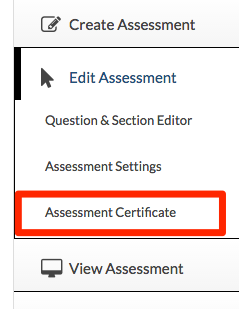 To access the certificate functionality click the Edit Assessment button on the left menu and then the Certificate link option. You have an email address as one of the login fields for a "public" assessment. If your assessment has "private password" access you can have the assessment login as an email address. Assessments with "private email" access will always have an email address present. The assessment is set-up to send finishing emails in the assessment settings. This is because an certificate is attached to an email as a PDF attachment. You can find more information on assessment access on Publishing on the Help. You can change you assessment email settings by going to Edit Assessment -> Assessment Settings -> Emails. You should also have the Name field as one of your key fields so that Brainsbuilder knows what name should be on the certificate. This is the basic information on the certificate such as the assessment name, your organization name, which key field is the name key field etc. You can have two images on your assessment which are configurable. These are usually a logo or a seal or a signature. Images used in certificates should not contain spaces as these images sometimes do not show in the certificate. The final review comment is a single comment the is shown at the end of the assessment. You have ways to control how your finish comments are displayed. Add a comment for different grade ranges This is useful for personality tests or where you want to give different feedback for different grade bands. Add a comment passing or failing You can enter a different passing and failing final review comment. Add a single final comment You can enter a single comment. This is the same for all respondents. These are the items of text that are displayed on the certificate. All of the items of text can be changed. This is useful for foreign language assessments etc. With Brainsbuilder you also have the choice of using the Preset template, or customizing your certificate with CSS. This is for those people with knowledge of HTML (Hyper-Text Markup Language) and CSS (Cascading Style Sheets). This is detailed in Templating section of the help subjects.